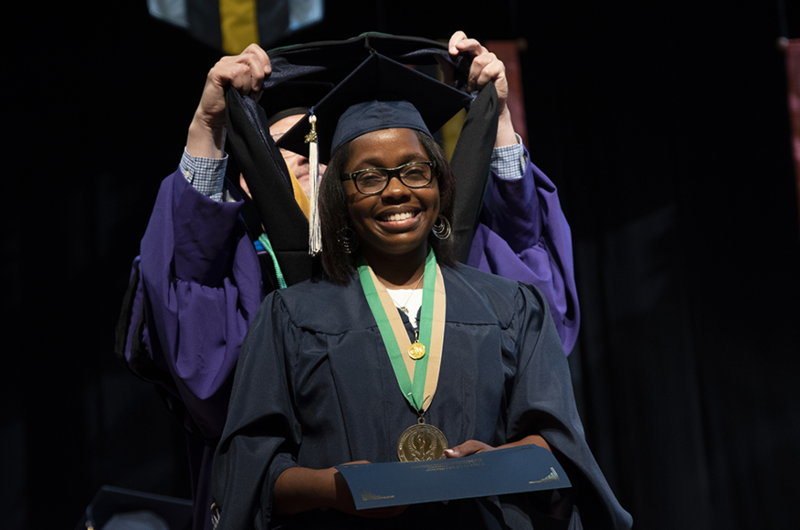 One message resounded throughout the George Washington University (GW) Health Sciences diploma ceremony: Never stop learning. “During my career as an OB-GYN, I’ve had countless opportunities to share points of view with colleagues, students, and faculty both in Europe and in the United States. There is one thing that always comes back: the more questions I ask, the more questions I have,” said Outstanding Graduate Award winner Laura Sanapo, MD, MSHS ’18, a fellow in the Fetal Medicine Institute at Children’s National Health System and research instructor of pediatrics at the GW School of Medicine and Health Sciences (SMHS). Reamer L. Bushardt, PharmD, PA-C, DFAAPA, senior associate dean for health sciences and professor of physician assistant studies at SMHS, echoed Sanapo’s remarks in his charge to the graduates. “I want you to commit today to aggressively pursue lifelong learning,” he said. He told the graduates that while they’ll never learn everything, they should harness the knowledge they have, and be mindful of what they don’t know. “Embrace collaboration and embrace interprofessionalism as a means to collectively problem solve issues that are greater than your capacity as an individual to face, and your teams and the patients and families in the communities you serve will be better because of it,” he said. Jeffrey S. Akman, MD ’81, RESD ’85, vice president for health affairs, Walter A. Bloedorn Professor of Administrative Medicine, and dean of SMHS, told the graduates to never lose sight of their principles. The Outstanding Undergraduate Student Award also was presented during the ceremony to U.S. Army Staff Sgt. Chase Jonathan Danell, BSHS ’18, a distance-education student. “I feel very fortunate for the opportunity to have been able to complete my degree online and been able to be part of this great community from, at times, the other side of the world,” Darnell said. He remarked that thanks to the hard work and dedication of others, including those who created his degree program and formatted it for online students, he was able to walk across the stage and accept his diploma.